The first hundred or so times we read our kids Click, Clack, Moo: Cows That Type -- Doreen Cronin's wonderful tale of barnyard subversion -- we slightly edited it into a tale of cows who find an old computer in the barn, because we knew Nini and Desmond had never seen or heard of a typewriter. Happily, that has changed, big time, and I've become a typewriter evangelist: If you've got a child old enough to peck at a keyboard, do your kid a favor and hunt down an old typewriter at your very earliest opportunity. We started with a portable Underwood manual typewriter I found at the Oneonta Salvation Army, and I cannot imagine a more ideal plaything for a young child. It's sublime in all the ways a kid wants a machine to be: sleek, virtually indestructible, with all sorts of fascinating buttons and moving parts whose operations are directly visible to the eye. A three-year-old can pound on it to her heart's content, and the worst thing that happens is the keys clump up into an easily separated jumble. What's more, a typewriter has a quality that's precious to children, and too often beyond their reach: realness. Kids are much more captivated by actual devices than by simplified kiddie versions. Past a certain wee age, they'd readily, for example, choose a battered actual screwdriver over a shiny painted wooden one, a real vacuum cleaner over a buzzy toy one; they would clearly prefer your real cellphone over some bright plastic beeping thing that spouts the same irritating three lines over and over. And without a doubt, once your child is interested in the alphabet and the very beginnings of reading and writing, a typewriter is a delightful tool. My kids will spend a solid hour or more asking us how to spell various words and patiently hunting down the letters on the keyboard. They can't write letters on paper yet, but they can now spell out their names whenever they want, and see the results. And unlike when they want to do this with the computer, we don't have to be right next to them, terrified that some crucial part of the hard drive will be destroyed through youthful exuberance: You pretty much don't have to say "no" to a kid who is playing with a typewriter. 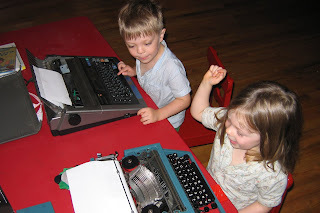 Eventually, since my kids are also fascinated by everything having to do with electricity, we got them an electric typewriter, too -- one of those early word processing types where the words show up on a screen before they're typed onto the paper. Alas, the ribbon that was in it quickly ran out, so for the moment, it's out of service. If you're like us, you'll probably end up spending more money on new ribbons for your ancient machine than you paid for it in the first place. Never fear, though, they can be found: For our Underwood, we even got our hands on one of those ribbons that types in black and red. This idea is positively brilliant! It makes perfect sense. The one problem is I fear I would have great difficulty with ribbon-changing etc. I will definitely be on the lookout for some old typewriters for Isadore. I think he would get a kick out of them and plus I've often wanted to use one myself. i love click clack moo too! happy click clacking, you two!